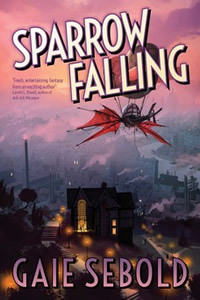 Eveline Sparrow hopes to put her past experiences as a thief and con-artist to more legitimate use; which is why some of the girls at her Sparrow School receive private lessons in burglary, fakery, and other such underhand practices. But it’s hard to get honest work when few businesses will employ young ladies in the security professions. The duns are at the doorstep, her friend Liu the half-fox-spirit is in some sort of trouble, and the rivalries of the Folk are in danger of overspilling into the mundane world and forcing the Empire into a bloody and horrifying war. Can Eveline pull things out of the mire this time, or will the Sparrow’s wings be clipped once and for all?